What Is a Grant & How Is It Used in Craft Brewing? 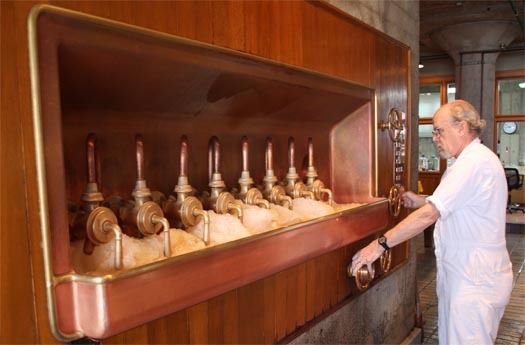 When visitors come to Anchor Brewing and see our beautiful traditional copper brewhouse for the first time, one of the questions they invariably ask is, “What is that thing on the wall?” What they are referring to is a large recessed copper trough with a number of spigots pouring what appears to be a high volume of frothing beer into it. This device is called a “grant”. In the era when Anchor’s brewhouse was built – over 75 years ago – all German-style breweries were equipped with a grant. The grant was installed between the lauter tun and the brew kettle, and the wort being run off from the mash had to go through it. There were a few reasons for this, but the most important one was that it allowed the brewers to observe the flow of the liquid as it was being transferred between vessels. Each one of the spigots was originally plumbed to a separate drain port located around the circumference of the bottom of the lauter tun. 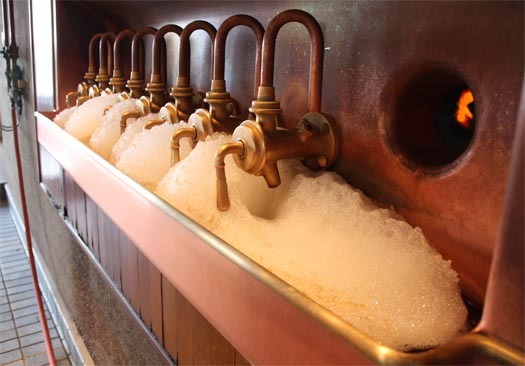 This allowed the brewers to adjust the flow from each spigot individually if they needed to balance the runoff, depending on the beer being brewed and the density of the mash. The open trough also allowed for wort samples to be taken for analysis. Anchor’s brewhouse was salvaged from a German brewery that was being dismantled. 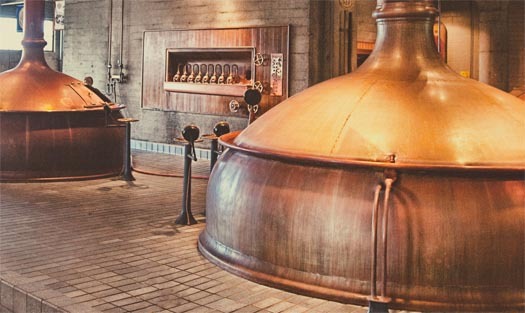 When it was re-assembled here in San Francisco, it was determined that with modern pumps and plumbing, as well as upgrades to the original design of the lauter tun, the grant was no longer needed. However, since it came with the rest of the brewhouse and it is a great visual piece, we decided to install it anyway. 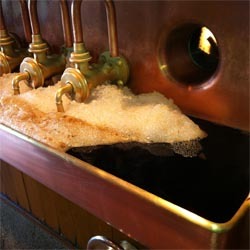 The spigots no longer control individual drain ports, but the wort from the lauter tun still flows through them on its way to the brew kettle.